Whitenoise is a Minneapolis band consisting of Jeff Dreblow, Travis Thorp, Brett Bjornrud, and Seth Conover. Grand Courriers began in February 2014 with their release of well received debut track, "Rejoice." Comprised of Minnesota natives, Donald Christiaan Lawson IV and Brady Lundy, Grand Courriers' use of warm brass woven in and out of their cinematic indie rock garnered attention from media such as NME, Line Of Best Fit, and HillyDilly. Lastly, the Minneapolis based indie/folk outfit with roots stemmed from the cold pines of northern Minnesota, Laulu will take the stage Wednesday night. The Hand consists of Zak Sally, Shawn Walker (Gay Witch Abortion), and Dale Flattum (Steel Pole Bathtub). Paul Erickson (Hammerhead, Vaz) and Adam Marx (Arctic Universe, Seawhores) combine to form Jet Legs. While American Cream is has been described as drone, noise-rock, improvisation, kraut, ambient, experimental, 21st Century Dance, and Progressive. Fury Things are a trio from Minneapolis, Minnesota, made up of guitarist/vocalist Kyle Werstein, bassist Devon Bryant, and drummer Andrew Carson. Werstein writes compelling lyrics and shreds fuzzy guitar solos while sharing the melody with Bryants bass. Carson slams on cymbals higher than his head and has broken too many drumsticks to count. Together theyre making fast, loud rock music reminiscent of Superchunk, Dinosaur Jr. and fellow-Minneapolitans Hüsker Dü. "Fragmented World" – the debut album from Split Single is a new project formed with fellow travelers Britt Daniel (Spoon, Divine Fits) on bass and drummer Jon Wurster (Superchunk, Mountain Goats, Bob Mould, Ben Gibbard, Robert Pollard), Split Single proves equal parts solo project and collective. Indie rock band The Damnwells came together 15 years ago in a downtown New York City storage unit hastily repurposed as a rehearsal room and imploded onstage at what should have been a career pinnacle: a live appearance to promote the release of a documentary about the band and its journey. Now, for the first time since 2006, the founding members have reconvened to release the band's most definitive album, appropriately titled, The Damnwells. "This album represents us rummaging through the debris and reclaiming who we are as a band and as a brotherhood," says primary songwriter, founder, and vocalist/guitarist Alex Dezen. Actual Wolf's Sundays in May Clown Lounge residency continues. This week's special guest is singer/songwriter Robert Skoro, who will perform a full set of his own following an solo (aka #LoneWolf) set from Actual Wolf frontman Eric Pollard. Doors for the Clown Lounge show open at 8pm, but the free movie screening on the Turf Club's main floor will start at 7pm. This week's selection is director Dennis Hopper's 1969 counter-culture landmark, Easy Rider. 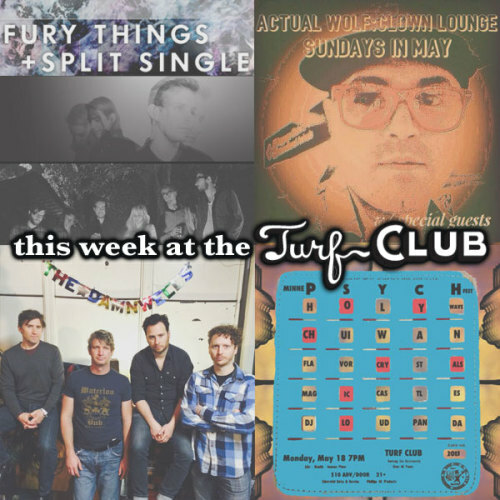 Monday night will feature a plethora of bands at the Turf club. Holy Wave is a band of multi-instrumentalists from Austin, TX. The band's sound has evolved into a unique blend of sun baked surf-psychedelia. Chui Wan is a four-piece experimental psychedelic rock band from Beijing, China. They get their name from Daoist philosopher Zhuangzi's "Qi Wu Lun" (齐物论), a mystical work on the relationship between nature and human life. Flavor Crystals are a four piece space rock based in Minneapolis, MN. Since releasing their debut album On Plastic (mpls ltd 2005), Flavor Crystals have continued to create engagingly floaty psych rock. Magic Castles are a five-piece psychedelic rock band from Minneapolis MN. Their sound has been described as minimalistic, dream pop & neo-psychedelic rock. Drawing from a myriad of influences, combining the hazy, "floaty" atmospherics of bands like Spacemen 3 and Galaxie 500, with the organ-drenched psych of the mid/late 60's--particularly American west coast folk-rock, Magic Castles continue to create an altogether unique sound.